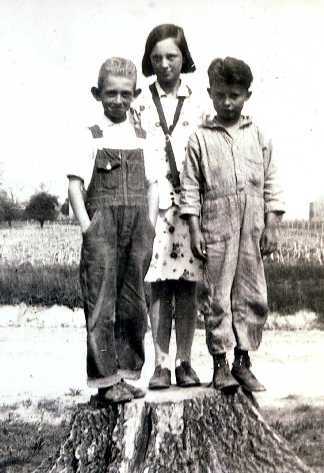 1934: Ray Provines, Lois Long (Lough), Pluma Smith, Russell Smith. 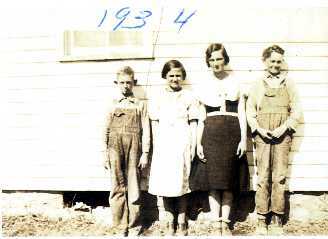 Lois is the one in the dark dress. 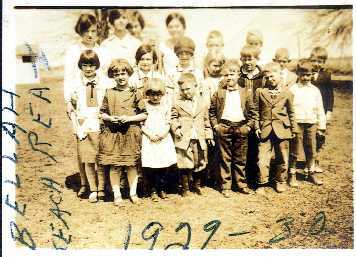 On the back of the picture is written "Victory School year 1928 - Last day of school. Mabel Weber is teacher. Lois Long Lough wrote in later years (Probably 1970 or 80's): Mabel Weber, Geneva, Alberta, Gladys, Anna, Lois Long, Burnice, Russell Smith, Arthur, Maynard, Pluma Smith, Marjorie, Ernest Short, Robert Wooden, Lela, Lowell, Harrison Read Jr. 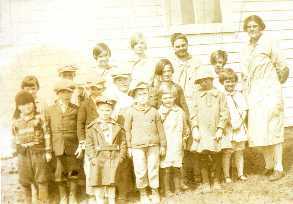 Written on the front is "Beulah Read - Teacher 1929-1930." On the back, Lois Long Lough wrote: Geneva, Belle Wiliams, Ruby Long, Gene Long, Margaret [Goodheart], Marjorie, Anna [Poole], Arthur, Lois Long [in the middle with the hat], Marjorie, Lela, Lowell, Maynard, Elmer Mundy, Russell [Smith], Robert Wooden, Burnice, Jr. [Harrison] Read, Patsy. Contributed by Barbara "Bobbie" Payne.